Although the weather was gloomy, spirits were high at the Act on Climate march in Quebec City on Saturday, April 11. People of all ages and from all walks of life, many having travelled from across the province or beyond, came together to make their voices heard on climate. Police estimates put the size of the crowd at 25,000 people. The message was loud and clear: we want cleaner energy solutions, and we want our government to prioritize the climate. 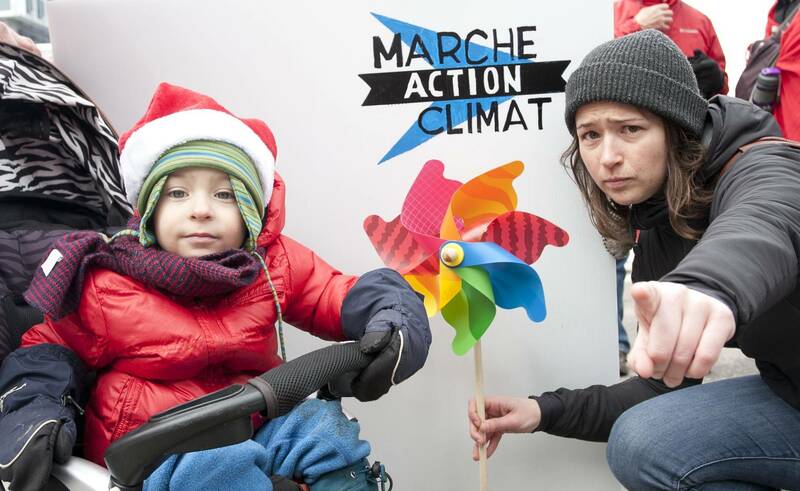 The Act on Climate march was nothing short of the biggest march focused specifically on climate in Quebec’s history. At every street corner there was something to be seen and a message to be understood from the street art that engaged passersby. A multitude of environmental and social groups joined the march. Surveying the crowd, one could find First Nations groups followed by Raging Grannies, and then suddenly be met with a hissing pipeline. Belugas were also represented, as well as the St. Lawrence river itself. Many people dressed up and brought pots, pans and other noisemakers. There was no way the event could be ignored. The march snaked its way towards the Château Frontenac from Hôtel Le Concorde Québec, winding up at La Fontaine de Tourny. 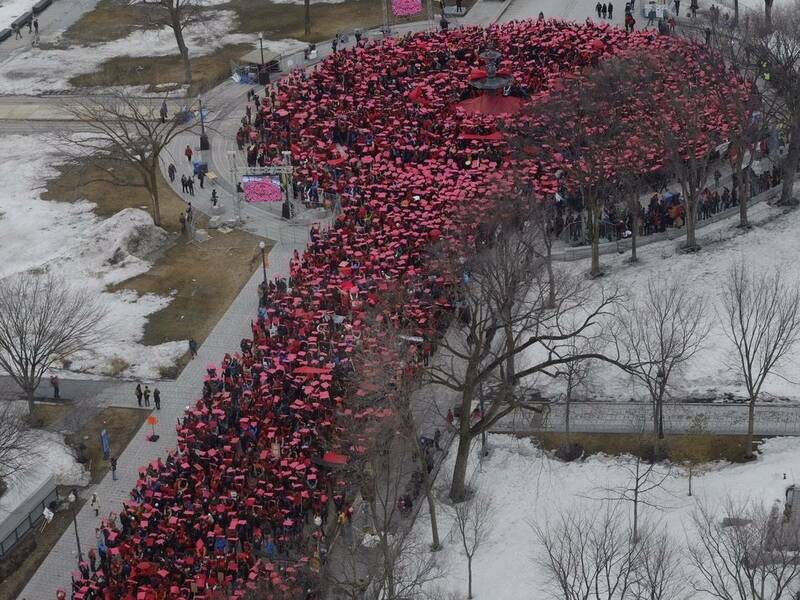 This is where rally organizers revealed the icing on the cake for the day: a giant human thermometer was created by participants at the end of the march route. 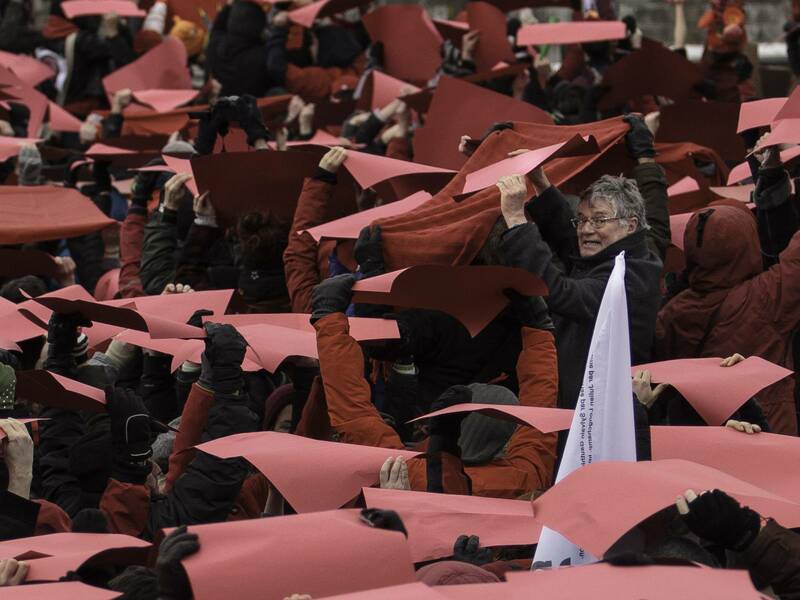 People were asked to raise big pieces of red cardboard up in the air and hold the pose. Given the great turnout, the visual exercise involved enough people to give the effect the organizers wanted — the thermometer looked like it was about to burst unless something was done soon. While the mood of the march was festive, the message was a serious one. Our governments need to realize that people are very much aware of what’s happening and will not stand by as money-driven policies that risk the destruction of the planet are rammed through. 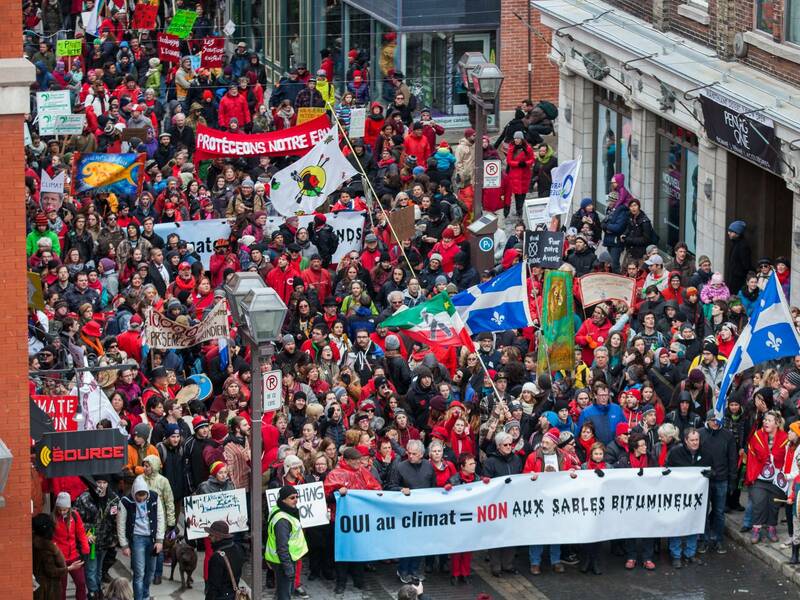 The mobilization was timed to put pressure on premiers from across Canada who are holding a summit on climate issues beginning this week in Quebec City. It should be noted that Quebec’s provincial government is showing signs of opening its eyes, at least in comparison to Prime Minister Harper, who has his head in the sand and apparently prefers to focus on spying on Canadians rather than protecting them from the dangers of the climate emergency. This was my first climate march. The energy was contagious. It was invigorating to be surrounded by people with strong convictions and powerful messages, and to be a part of something so big and of such importance. Harper can no longer ignore Canadians, who know more than ever that their lives are directly affected by his climate policies, or his lack thereof. Saturday’s attendance of 25,000 shows that he cannot continue on the path that he has taken. Canadians simply will not let him. The message for our provincial governments, was that while some may be more engaged than their federal counterparts, don’t consider the job done. Work towards a cleaner future for the people who trusted you with office, listen to their demands and understand that they will not let you off the hook easily. Because on this day, it seemed clear that the people have spoken.